Kepa Arrizabalaga "understands his mistake", said Chelsea boss Maurizio Sarri after the goalkeeper marked his return following a club fine with an excellent display in victory at Fulham. Kepa was dropped for the midweek win over Tottenham after refusing to be substituted in the Carabao Cup final with Manchester City. He was recalled on Sunday and made important saves as Chelsea won 2-1. "Kepa is a man. He understood the mistake," Sarri told BBC Sport. "He was able to react very well." Kepa, 24, was fined a week's wages and apologised after he refused to be replaced by Willy Caballero at Wembley last Sunday. On Friday, Sarri said he had not decided whether to recall the £71m signing from Athletic Bilbao for the match with Fulham. However, the Spaniard produced a man-of-the-match performance after being named in the side to face struggling Fulham at Craven Cottage. With Chelsea leading 1-0, he made an outstanding acrobatic save to keep out Aleksandar Mitrovic. 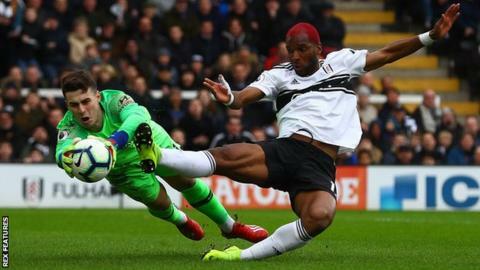 Kepa also frustrated Tom Cairney and Joe Bryan as Chelsea went on to record a first away league win of 2019. Meanwhile, former Chelsea manager Jose Mourinho has backed Kepa to flourish at Stamford Bridge after last week's "misunderstanding". "There were a lot of factors that made us think it was big - in the end it was not that big because it was a misunderstanding," Mourinho told Bein Sports. "I have a few friends at the club and everyone speaks amazingly well about Kepa. They say he is a great kid and is not capable of this confrontational attitude and when the inside information is this positive, I believe this."